Welcome to aquametrix.ca - your single source for Aquametrix and Water Analytics Products in Eastern Canada. We stock, sell, service, repair and calibrate Aquametrix products. Industrial Technical Services have been providing instrumentation and controls products and services since 1982 and have industry leaders as loyal clients. We are one of the premier Single Source Instrumentation & Automation Products and Services providers in the region. 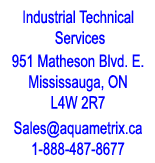 Industrial Technical Services is a stocking distributor for Aquametrix and Water Analytics for Eastern Canada. We stock, service, repair and calibrate Aquametrix and Water Analytics products. Aquametrix differential pH and ORP probes are found in the most hostile processes in industry. Where other sensors typically last months the P60 line sensor lasts years. Three series of conductivity sensors cover any application from ultra-pure to brine solutions. The P91 dissolved oxygen sensor has been installed in thousands of installations worldwide. Shark analyzers exemplify the Aquametrix reputation for simplicity and durability. The Shark controller and Shark TX handle a pH, ORP, conductivity or flow sensor with a simple menu change and comes complete for NEMA 4X operation with no added costs. No other company offers a two year in-field warranty.